Agreements Customizable contract templates that look professional. Testimonials Straight from the heart, straight from our members. Good company The free creative community for sharing opportunities and high fives. 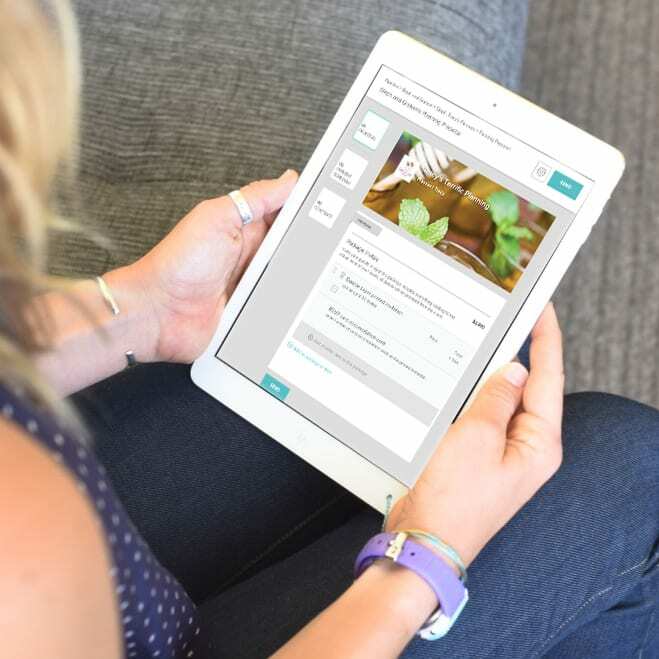 HoneyBook streamlines and automates your client's experience from inquiry to final invoice. 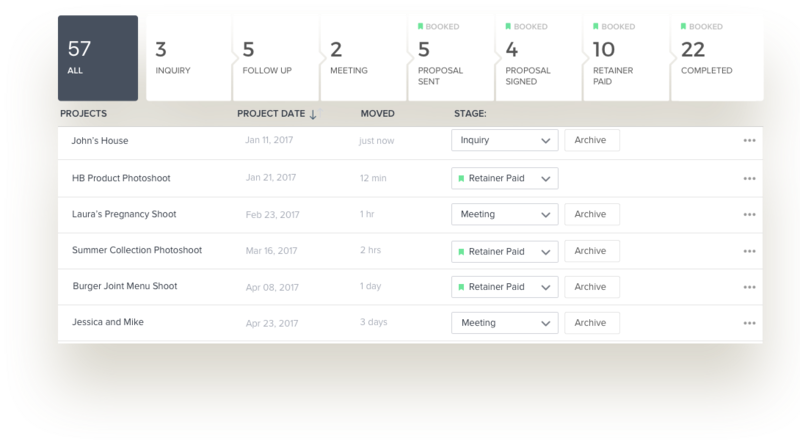 We keep your clients moving through the workflow with automated reminders and notifications. 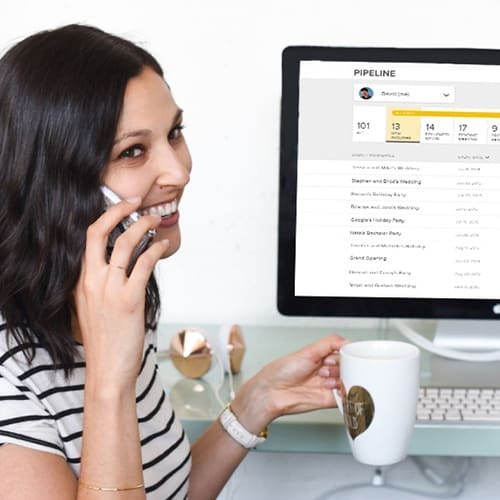 Your pipeline visualizes where you are with your clients and what you need to work on, all in one place. With HoneyBook, you can offer your clients the ultimate experience to view your beautiful proposals, sign & pay effortlessly without ever having to print or mail a thing. All client documents are stored in one place so you can access files and notes no matter where you are - on your laptop or smartphone. Offer your clients the ultimate experience to view your beautiful proposals, sign & pay effortlessly without ever having to print or mail a thing. All in one place, effortlessly manage your documents, clients, conversations and finances. Send stunning brochures, proposals, contracts, and invoices that enhance your brand and help you close more clients. Automate the administrative pieces of your workflow, from collecting payments to sending questionnaires. "It’s revolutionized the way I do business with my clients. My clients love seeing when their payments are due." "Professional, clean, automated proposals give my clients a great first impression of my business. " "I am not good at asking for money, so automatic payment reminders help eliminate the awkwardness." "I love it! I have already saved time on contracts, emails, and billing!" "I’ve significantly streamlined my workflow, simplified payment processing, and drastically reduced agreement development time." "I spend less than half the time composing proposals, contracts, and invoices than I did before using it." We believe in quality, we believe in design, and we believe in protecting your business so you can focus on what you do best. Our team treats you the way you treat your clients. Over $200,000,000 in bookings & counting. Thousands of creatives trust us to run their business. No business has ever lost a dollar to fraud with us. client process running your way. Bullet proof your process, so you never miss a thing. Control your client process like never before.